A while back I asked for your prayers about three writing projects. Thanks for your prayers as I have been urgently working on these projects that I believe are critical to equip intercessors for the prayer battles that are already upon us. 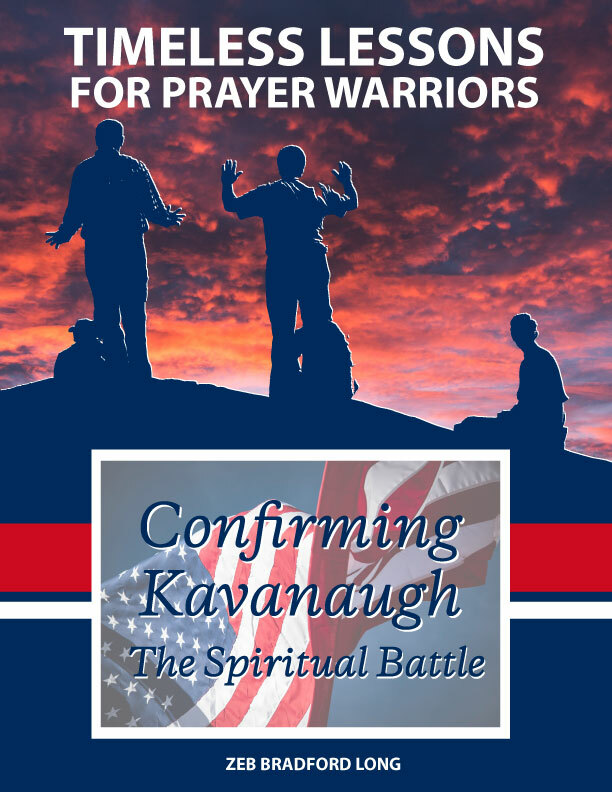 The first book, Timeless Lessons for Prayer Warriors—Confirming Kavanaugh: The Spiritual Battle, is nearly finished. 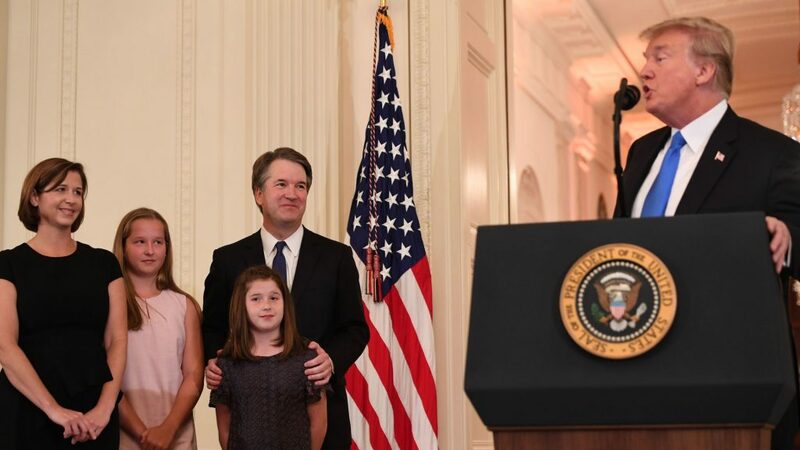 This picture was taken on July 9, 2018, when President Trump publicly introduced Judge Kavanaugh along with his wife and their two daughters. 1 One of our PRMI intercessors said, “When I saw that lovely family standing there, the Holy Spirit fell upon me and called me into the gap to pray for them. The Lord said, ‘Pray for grace and for protection for them for the fiery ordeal that is ahead.’” This intercessor was not the only one called into this battle; I was too, along with the PRMI POTUS prayer network. This led to an extraordinary six-week spiritual battle for the confirmation of the judge. During this time, we experienced three major prayer engagements in the heavenlies, cooperating with the Holy Spirit, battling the “powers and principalities,” and taking part in God’s Kingdom plans in the war to defend the Judeo-Christian values which have formed the soul of America. This prayer battle took place simultaneously in the spiritual realm and the physical realm with political battles taking place in the halls of the US Congress. My purpose in providing the details of this battle, followed by after-action reviews, is to provide timeless lessons for intercessors which can be applied in future battles. The work of intercessory prayer always takes place within the struggles happening in both the spiritual realm and the earthly human realm. It takes place within a certain time frame and geographic location. This is because the unseen forces of the Kingdom of God and the empire of Satan are always working through the muddle of politics, clashes of ideology, and human agendas. So this battle was centred in America and was focused upon an originalist judge being confirmed to the US Supreme Court. This was a battle to maintain the Judeo-Christian values that are embodied in the US Constitution. This American-centric and even patriotic aspect of this battle is captured well in the book cover. The American flag which looks tormented is intended to convey the battle for the preservation of Judeo-Christian values in the soul of America. This is an ongoing battle and the outcome is still undecided. The role of the intercessor is to step into the gap as Jesus’ friend and coworker, into the heart of the conflict, cooperating with the Holy Spirit in defeating Satan’s plans while advancing God’s plans. The gap we were called into with this confirmation battle was the war for the soul of America. This may be briefly identified with the following question: Will this nation remain grounded in the Judeo-Christian values that our founders embodied in the US Constitution? These values have effectively constrained the potential for evil by checking human power and protecting the unalienable rights of “life, liberty and the pursuit of happiness,” that they are endowed with by their Creator. The alternative is that these values will be replaced by ones that reject God as the giver of our rights. Instead, the government and society are seen as the source for our rights. History has amply demonstrated that such alternative values result in the silencing, enslavement, or death of all who do not fit the utopian vision of those in power. This is the national context for the prayer battle. The spiritual and political battle to confirm Kavanaugh was but one skirmish in the larger war that is being waged in the world today. 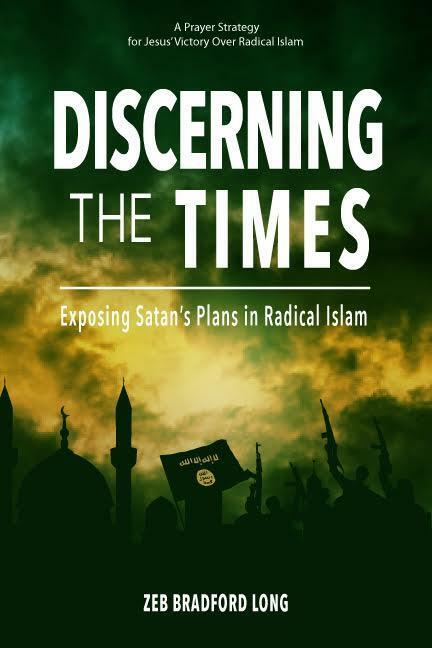 It was an engagement against the demonic strongholds being built from the hateful totalitarian ideologies of Radical Islam, the Radical Right, and the Radical Left against the Kingdom of God. At this hinge point in history, Satan is mobilizing his forces with the intention of destroying and replacing the Judeo-Christian value foundations of the USA, Canada, and the United Kingdom. The intercessors involved in these engagements were from these three nations and from different political parties and perspectives. But all were called to engage the “powers and principalities” that transcended politics and cooperate with the Holy Spirit in defeating demonic strongholds and advancing God’s global Kingdom plans. 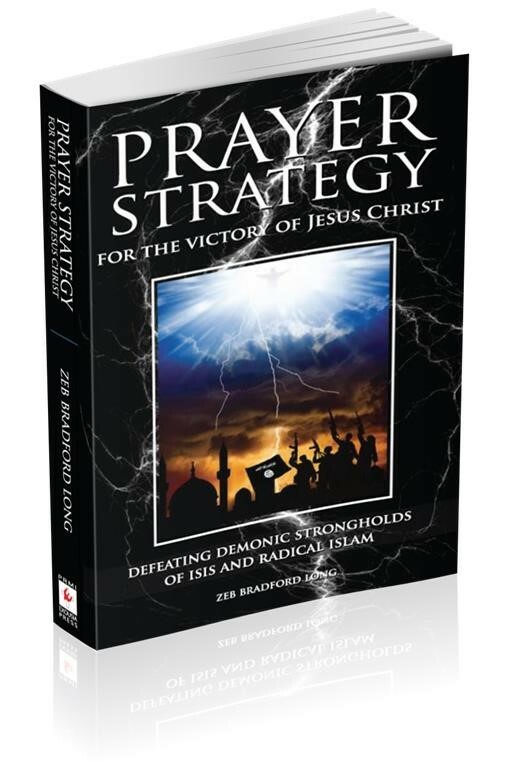 I have a great urgency to get this book into as many hands as possible because if intercessors are not mobilized, equipped, and deployed into effective networks and cohorts, crucial battles may be lost. What I learned from the prayer battle for Brett Kavanaugh—one of the timeless lessons— is that equipping of cohorts to engage in high-level intercessory spiritual warfare allows them to play a strategic role in defeating Satan while advancing the Kingdom of God. I believe that God has given PRMI and the Dunamis Fellowship International a strategic role in equipping and deploying intercessors for cooperating with the Holy Spirit in defeating Satan’s plans and advancing the Gospel of Jesus Christ worldwide. Judy Cook the main editor of the book wrote the following for the back cover. She captured the content and importance of the book for those who are not part of the PRMI/DFI family. Can a small, unknown, dedicated prayer team truly make a difference? We see the evil; we know there is power in prayer. How exactly do we cooperate with Jesus to dismantle the strongholds of the enemy? Here is a look behind the scenes. Long is a general sharing personal battlefield experience, allowing serious intercessors to see how Jesus calls and guides us through dangerous battles using advanced spiritual weaponry Jesus shared with him. In this detailed report of the spiritual battle fought by intercessors in a series of engagements with demonic powers, we see into the inner working of the small team. There are no steps or formulas here, but rather real people yearning to see evil defeated, willing to love one another and work together, demonstrating timeless principles instructive for serious prayer warriors. These simple but profound lessons are named and illustrated during a very public and contentious event—the confirmation hearings of Judge Brett Kavanaugh to the Supreme Court of the United States. The current war for the soul of America will contain many more such battles. This book will give you vital intelligence, understanding, and confidence to effectively engage. Please pray that the final editing and layout will proceed smoothly so we will get this out soon so that Holy Spirit may use it to equip intercessors for the battles ahead. Thank you. We need your strong cover as the warfare has been intense but the Holy Spirit’s anointing is powerful! Note: Earlier this week after writing this blog, Brad fell while he was out at the Community of the Cross. He landed badly on his shoulder and broke his collarbone. He is expected to be in considerable pain for the next couple of weeks. This limits Brad’s ability to work as quickly on the book as he would like. So, please be praying for Brad’s healing as well as this final editting process. Bless you Brad. Bless you all who are praying into this. May the Holy Spirit continue to sweep you up out of satan’s path. Amen. Brad; Linda and I will be lifting you up in our prayers. You have been a part of our lives for several years now. I know the feel of pain also. I know satan and the hordes of darkness do not like those of us who have been called to be warriors in prayer. We saw the power of God bring President Donald Trump into office on the night of the election. We are going to witness His unlimited unconditional power heal your body as well. HR does not mean honorably retired, but Healed to be retreaded. I am praying for you. And according to Ephesians 3:20 that the Lord will GREATLY reduce pain from your injury as He heals you and will GREATLY speed up your healing. And that He will enable you by the power of His Spirit to complete “Timeless Lessons for Prayer Warriors “ in God’s perfect time! Praise God and His blessing on you, your family and PRMI. I have been praying Gods Word for you and PRMI daily. Will continue. Brother Brad, as you know, what happens in the natural is a manifestation of what is going on in the spiritual realm. The meanings of the Hebrew words for shoulder are varied. The first, shekhem, is used for the part of the body on which heavy loads are carried (Genesis 21:14; 24:15, 45; Exodus 12:34; Joshua 4:5). The Levites carried the implements of the sanctuary on their shoulders (Numbers 7:9; 1 Chronicles 15:15). To carry loads on the shoulder is representative of subjection and servitude…and the removal of such burdens, or of the rod of the oppressor, connotes delivery and freedom (Isaiah 9:4; 14:25). In Luke 22:31, the Lord tells Simon that satan desired to sift him like wheat, but He had prayed for him, and when it was all over, to go and strengthen his brothers. The shoulders also bear responsibility and power. Therefore, it is said of the Messiah, that “the government shall be upon his shoulder” (Isaiah 9:6) and “the key of the house of David will I lay upon his shoulder; and he shall open, and none shall shut; and he shall shut, and none shall open” (Isaiah 22:22). God has placed upon your shoulders a governmental mantle. Satan has tried to sift you like wheat, to break God’s mantle off of your shoulders. Instead, your God has broken the rod of the oppressor off of your shoulders, and Jesus, your advocate, is standing at the right hand of the Father praying for you. After Zion travailed, she brought forth many children. Your pain will pass quickly, and you shall strengthen your brothers once again. Your book is ‘The key’ [of the house of David], and it will open doors to God’s revelation and shut doors in the demonic realm. I see God holding your book in the palm of His hand. Do not fear, God has it all in His hands, and nothing will be lost, not even God’s timing! I am praying for you. Blessings and speedy recovery! My dear brother Christ. I am praying for you and I am reminded of the prayer in Ephesians 3: 14-21. The love and the power of Jesus Christ is with you. This is the prayer for you. He will heal you of your pain and protect you and your family. Bless you dear Brad as God in Christ holds you in His hand. Vernon Payne from across the pond.